Whether you’re looking for a seven-night adventure or a 14 night exploration that extends as far as Mexico and South America, Celebrity offer many exciting ways to discover the Caribbean while experiencing their commitment to service with style. Celebrity are also the only premium cruise line to offer guests a private resort sanctuary – Labadee, on the island of Haiti. Celebrity helps you seize the tropical nights with our unique “Evenings around the World” shore excursions. Cocktail hour takes on an unforgettable vibe when you’re sipping drinks on a sunset catamaran sail around Aruba — or sharing a toast with new friends at a beach bonfire in Cozumel. 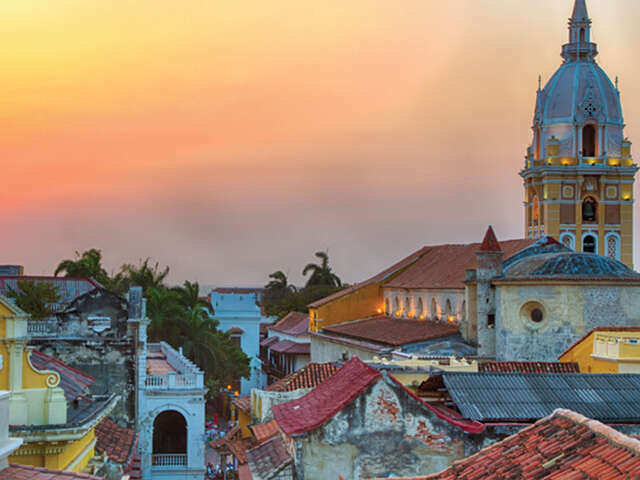 The setting sun reveals a world of culture, whether you’re taking a horse-drawn carriage through the cobblestone streets of Cartagena or strolling by the pastel-colored houses in Curacao — both named UNESCO World Heritage Sites. Of course a longer day (and night) in port means you’ll need to recharge. Return whenever you want to world-class accommodations on board, where every detail, service, and amenity are so well thought out that you’ll wish you could extend your stay indefinitely. Re-fuel in 12 distinctive restaurants where the vibe is as appealing as the cuisine. You’ll experience a level of service so intuitive, you’ll be amazed when you get just what you need a nanosecond before you even knew you wanted it. There’s all that, plus a wide variety of activities to complement your experience on land. Celebrity don’t just meet your needs, they do their best to anticipate your desires – from nightly turndown service, to remembering your favorite dessert. With one staff member for every two guests, we’re able to ensure that nearly every request is attended to with intuitive efficiency. A Caribbean cruise is the perfect way to bring generations together to celebrate any occasion or milestone – from weddings and anniversaries to family reunions. Be indulged with expansive, stylishly designed rooms featuring floor-to-ceiling windows and a personal butler who’s job it is to ensure you never have to lift a finger while on vacation. You’ll be our number one priority with priority check-in, embarkation, and debarkation. You’ll enjoy a complimentary welcome bottle of wine; 24-hour complimentary room service; in-suite savories every afternoon; Blvgari luxury bath amenities; and a dedicated restaurant, Luminae, for only suite guests to dine for breakfast, lunch and dinner. Personal Concierge is available to you 24 hours a day in Michael’s Club for Signature, Royal, Penthouse, and Reflection Suite guests. Enjoy complimentary cocktails before dinner during daily “Happy Hour,” enjoy unique food and beverage experiences provided by our James Beard-featured chef, catch up on your reading with the wide selection of magazines, newspapers, and books, or just kick back and relax in this cozy lounge that’s dedicated just for you. When you sail Celebrity to the Caribbean on a vacation that’s 10 nights or longer, you’ll enjoy an overnight experience in one of your ports of call such as Aruba, Curacao, and Barbados. And now we’re introducing more overnight destinations, including Cartagena, Colombia; St. Maarten; and Cozumel, Mexico. That’s more than 40 sailings to choose from—and 6 vibrant locales to experience in a whole new way. Let Celebrity tantalize your palate with their award-winning cuisine. Prepared by renowned chefs, their culinary delights are made from scratch using only the finest ingredients. • New menus throughout each ship including their specialty restaurants. • New presentations for our sushi bars, snack bars, and themed restaurants, including expanded offerings made just for kids. • Revamped room service, including the kids’ meals that can be delivered to their stateroom while the adults enjoy dinner on their own or a nightcap at the Martini Bar. Discover a wealth of fun for toddlers through teens, with XClub programs divided by age so kids will always be entertained. To ensure the voyage is an enriching one for younger travelers, we’ve developed an exclusive partnership with Leapfrog Schoolhouse™ to offer Leapfrog®Entertainment.